Peter Sauer was born in Norka, Russia on February 2, 1900, the youngest son of Conrad Sauer and Catharina Margaretha Sauer (née Glanz). In 1901, when Peter was merely 16 months old, his father Conrad Sauer died of a sudden and massive heart attack after drawing water from a well where he died in front of his oldest son Lüdwig. Peter was raised by his uncle, Nicolaus Sauer and his wife Christina Sauer (née Arndt). The family emigrated from Norka in 1906 and settled in Lincoln, Nebraska. 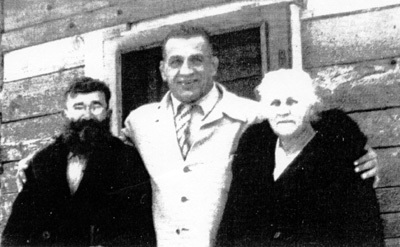 Nicolaus, Christina, and Peter jointly became American citizens in 1916. Peter's widowed mother, Margaretha, later came to America and also settled in Lincoln reunited with Peter and Lüdwig. Lüdwig, who changed his name to "Louis" or "Louie," was the father of the famous George Heinrich Sauer who played football for the Nebraska Cornhuskers and Green Bay Packers. George's son, George Sauer Jr., would also become an outstanding football player and NFL star. 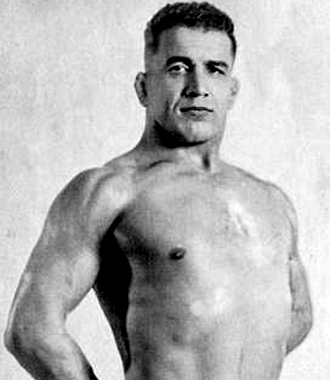 Peter (Pete) Sauer was an outstanding wrestler and after a brief amateur career, he became one of the finest professional wrestlers of the 1930's and 1940's. Early in his career, he wrestled under the names Peter Sauer, Pete Sauer and the Masked Marvel, but he was most well known as Ray Steele. Billed as six feet tall and 210 pounds, Steele was known for his lightning-fast reflexes and vast knowledge of the sport. Steele worked a catch wrestling style in his early career. On May 16, 1934 he wrestled Orville Brown to a 30-minute draw. Steele also gained some notoriety in 1936 when he faced heavyweight boxing contender Kingfish Levinsky in a mixed match, which Steele won in 35 seconds. Steele's biggest accomplishment in the sport was winning the National Wrestling Alliance (NWA) world heavyweight title in St. Louis on March 7, 1940 in a match with the great Bronko Nagurski. Steele would hold the belt for over a year before losing it back to Bronko Nagurski on March 11, 1941 in Houston, Texas. Steele continued to be a top attraction for many years and he served as a mentor to many top young pros on the way up, including Lou Thesz, who ranked Steele as one of the finest wrestlers he ever knew. Like his father, Ray Steele died of a heart attack at the young age of 49 on September 11, 1949 in Warm Lake, Idaho. Ray Steele was inducted into the Wrestling Observer Newsletter Hall of Fame in 1996, the National Wrestling Hall of Fame in 2002 and the Professional Wrestling Hall of Fame in 2008. He will be remembered as one of the truly great professional wrestlers in American history. A plaque commemorating his accomplishments has been donated to the American Historical Society of Germans from Russia and is displayed at the headquarters in Lincoln, Nebraska. Baxmeyer, Donna. A relative of Peter Sauer. Krieger, Jerry. "The Gentle Giant from Norka made a name for himself in wrestling". Norka Newsletter. Winter 2002. Wray, J. G. "Wrestling Mourns Ray Steele" St. Louis Post-Dispatch. September 13, 1949. Last updated July 7, 2018.